What Is the U.S. Up To On The Continent? 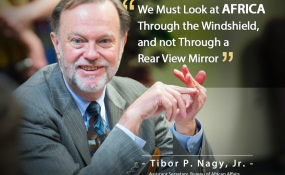 Assistant Secretary for the Bureau of African Affairs Tibor P. Nagy will travel to the United Kingdom, France, Togo, Guinea, Mali, and Nigeria October 29 – November 10. During his trip, Assistant Secretary Nagy will focus on promoting stronger trade and commercial ties between the United States and Africa, harnessing the potential of Africa’s youth, advancing peace and security through partnerships, and conveying the United States’ unwavering commitment to Africa. Assistant Secretary Nagy will then travel to Lomé, Togo on November 1 where he will meet with Togolese government officials, and lead a regional U.S. Chiefs of Mission Conference.